Buffalo Bill’s Disputed Dagger Cutting to the truth of a purported Buffalo Bill Cody dagger. From P.T. Barnum to Buffalo Bill Cody, successful 19th-century showmen knew that a degree of truth was essential to the most potent deceptions. This dance of artifice and sincerity was more than a trick, but a true embodiment of the American frontier experience. In communities seething with humanity, but not much law or order, folks had to discern for themselves what was real and what was not. Cody constructed a powerful identity by merging his real biography with imagined exploits. That same ambiguity is embodied in a dagger with purported ties to the famous showman behind Buffalo Bill’s Wild West, which J. Levine sold on January 22 in Scottsdale, Arizona. 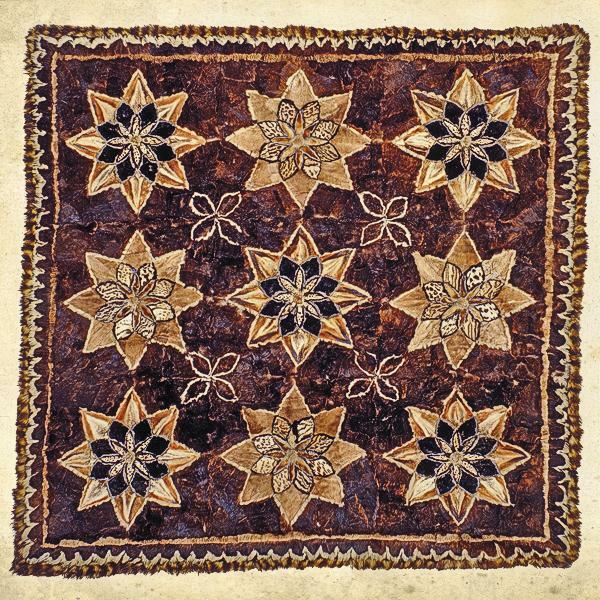 The anchor of authenticity is a January 1872 buffalo hunt on the Nebraska plains that Cody guided in his pre-showman days, before his scouting experience in the Indian Wars that spring earned him a Medal of Honor and national acclaim. Army Gen. Philip Sheridan organized the hunt in honor of Russia’s Grand Duke Alexis, who was touring America five years after the nation purchased Alaska from his father, Czar Alexander II. The Grand Duke presented Cody with gifts in appreciation for his service. But was this Western-style dagger among them? 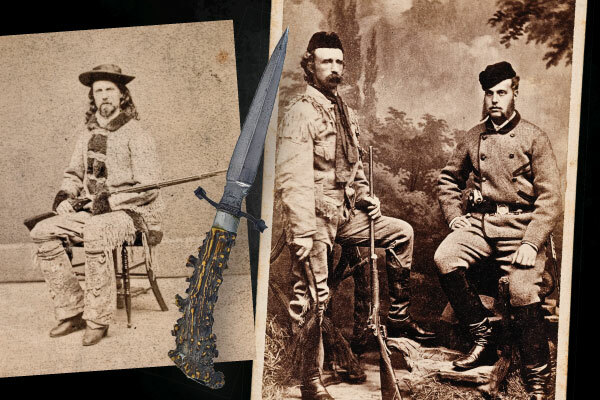 “Regarding the dagger, I could find no historical evidence of Cody receiving such a gift from Grand Duke Alexis,” says Jeremy Johnston, curator of the Buffalo Bill Museum and Western American History at the Buffalo Bill Center of the West in Cody, Wyoming. He also confirmed that the historical record does not show Cody receiving this gift from the czar either. The dagger’s provenance does not track to Cody himself, but to two museums. A letter from a museum in Nome, Alaska, stated this dagger was given to Cody by the Czar as a token of thanks for taking his son on the Royal Buffalo Hunt. Which museum that could be is unclear. Josh Levine stated that the gap between this museum and the second museum was in the late 1920s to the early 1950s. Cheryl Thompson, the collections assistant at Carrie M. McLain Memorial Museum, which opened in 1967 and is Nome’s only museum today, asked around to see if Nome had a museum in the 1920s, but she could not locate anybody who had heard of one. The dagger was next found in Nevada, purchased by Milos “Sharkey” Begovich to display in his Old West museum at Sharkey’s Nugget Casino. A first-generation American of Serbian parents who immigrated to Jackson Gate, California, Sharkey may have been drawn to the dagger because of its purported ties to the czar of Russia. His family congregated at the Serbian Eastern Orthodox Church, blessed in 1894 by a Russian bishop who oversaw Alaska and the Aleutian Islands when Russia still owned Alaska. The dagger’s alleged link to Cody would have sounded perfect for an Old West exhibit. But just like the audiences who gathered before Barnum and Cody, a collector today discerns for himself what is real and what is not. If Cody were here, he wouldn’t quash any claims about this dagger that sold for a $5,500 bid—he’d encourage them. 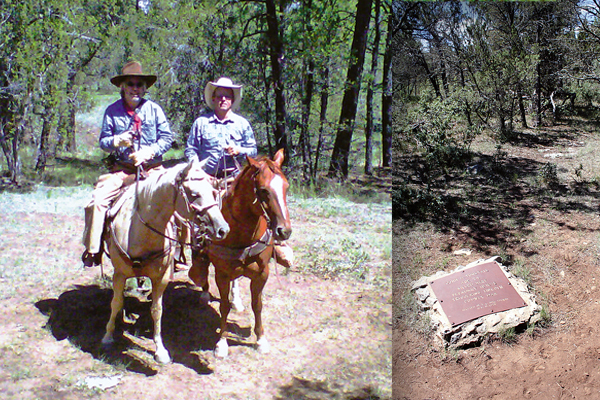 Historians prefer to honor Cody’s real achievements, but he gilded the lily when given the opportunity. For some genuine golden treasures with ties to Cody and the 1872 buffalo hunt, check out the additional collectibles featured here. 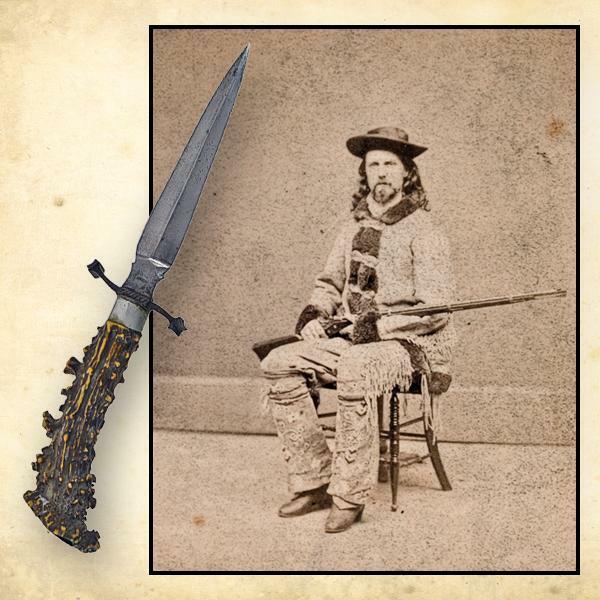 The alleged Buffalo Bill Cody dagger (inset) that sold for a $5,500 bid on January 22 has decreased considerably in value since the $12,000 hammer price paid in 2007 at an Arizona auction produced by Bob Greene, who had purchased the knife from the Sharkey Estate. 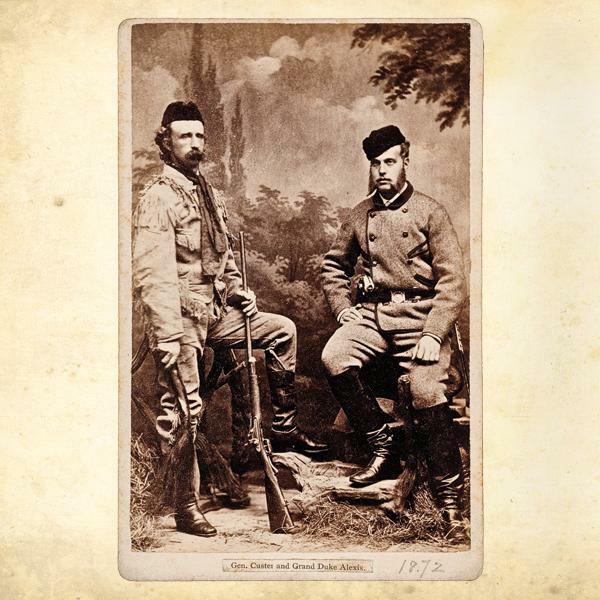 Historical photos of the 1872 buffalo hunt have sold for thousands at auctions: Collectors bid $1,300 each for these shots of Cody, circa 1870s, in his buffalo hunting gear (above left) and Gen. George Custer with Grand Duke Alexis (next slide). Alexis’s father, the czar of Russia, also thanked Cody with a gift: a fur carriage robe featuring geometric patterns. 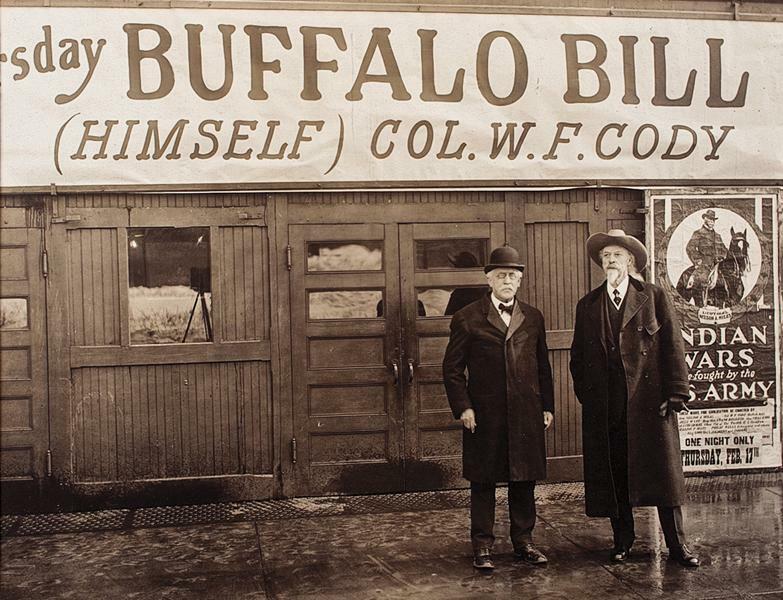 The Wild West showman later gave the robe to retired Gen. Nelson Miles, which his grandson, Samuel Reber, donated to the Buffalo Bill Center of the West. Cody stands in front of a movie theater with Gen. Miles who helped re-enact the Indian Wars for Cody’s 1914 docudrama; $2,300. 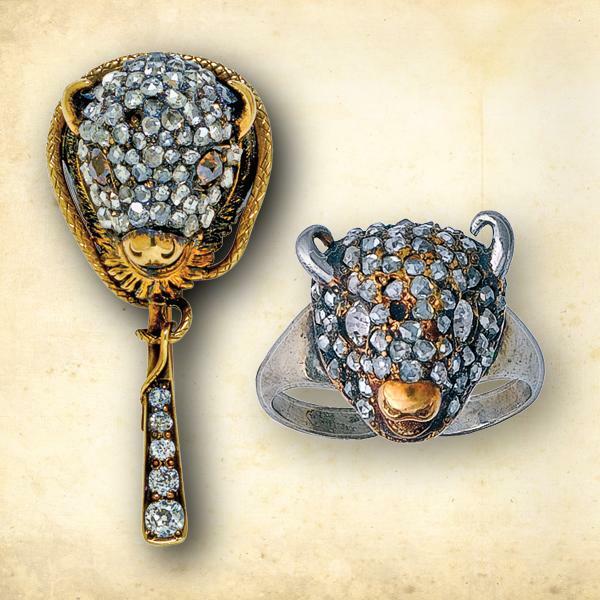 In gratitude to Buffalo Bill Cody for leading the 1872 buffalo hunt, the Grand Duke Alexis gave him diamond-studded buffalo head jewelry, including cuff links, which Cody converted to a brooch (right), and a stick pin Cody converted to two rings (one shown); Provenance: Cody’s grandson, William Cody Boal. During the Royal Buffalo Hunt, the Grand Duke rode Buckskin, a horse Cody had gotten from one of Frank North’s Pawnee scouts at Nebraska’s Fort McPherson. Descended from the North family, the Winchester Model 1873, serial 291, that Cody gave North bid in at $75,000. 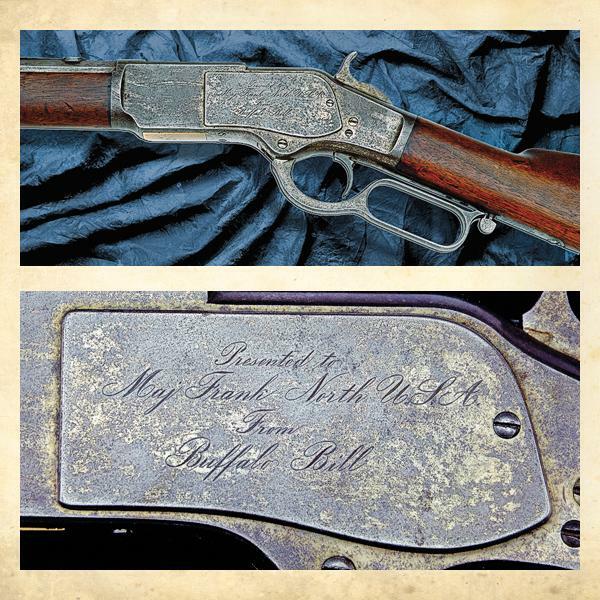 Inscribed with his then-new sobriquet “Buffalo Bill,” this sporting rifle is the earliest known Winchester presented by Cody. Almost Getting Killed… ...at the John Tunstall site. 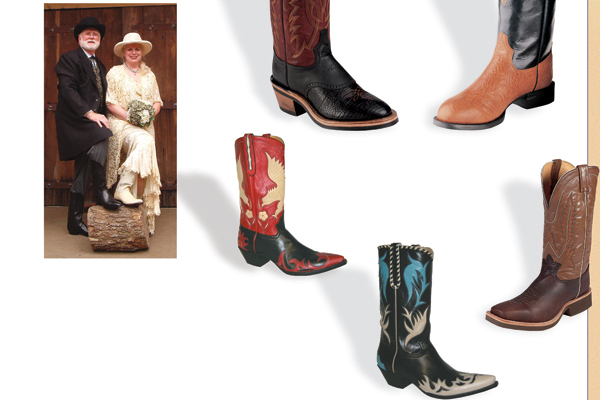 Boot Scootin’ Boogie Whether a night on the town, or a ride on the range. 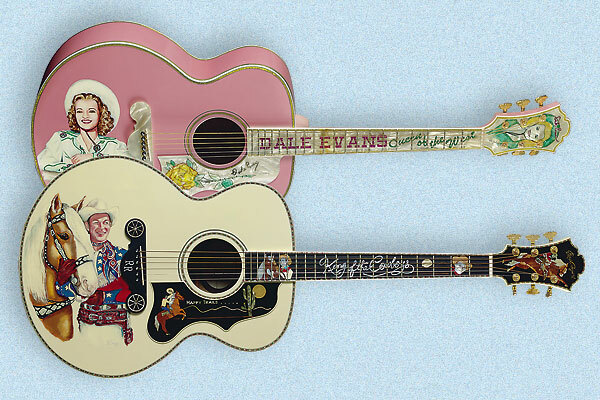 Sons of the Pioneers Spice Up Music Auction The musical group that helped Roy Rogers get his Hollywood start kicked off Christie’s Country Music sale.